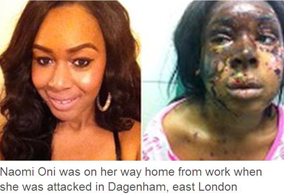 Naomi Oni, 21, suffered burns to her face and chest on 30 December 2012 in the attack near her home in Dagenham. Mary Konye, also 21, dressed in a veil and attacked Ms Oni after following her home, Snaresbrook Crown Court heard. Konye, of Canning Town, denied throwing or casting a corrosive fluid with intent to burn, maim, disfigure, disable or do grievous bodily harm. She attacked Ms Oni, an assistant at a Victoria's Secret lingerie shop, because she once called her ugly, the court heard.